This information is relevant to the CBS Colecovision (PAL). 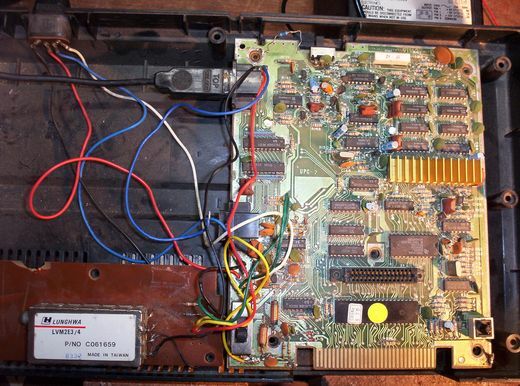 This is a circuit diagram of the latter part of the Coleco's video circuit. Components in red are additional parts required to drive a standard TV/Monitor. The Video wire (blue) must be disconnected (thus disabling the RF out) in order for the transistor amplifier to fuction. 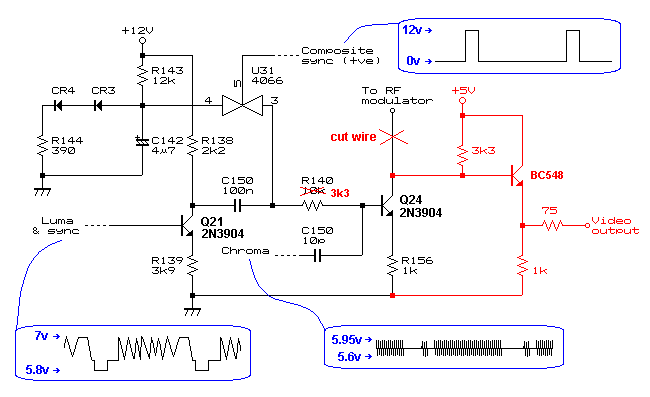 I reccomend lifting the leg of Q24 off the board and connecting the 3k3 resistor between the lifted leg and the nearest +5v point as this part if the circuit is susceptible stray capacitance. R140 should be reduced to about 3300 ohms. This actually forms a low pass filter with Q24 (miller effect). You may want to adjust this value to your tase (don't use a pot!). Higher value = softer edges and less dot crawl (chroma interference), lower value = sharper edges. The resaulting video signal is of very good quality with only minimal dot crawl. I didn't bother to trace out the audio circuit. Just intercept the wire going to the modulator board. Use a resistor divider to attenuate the signal.